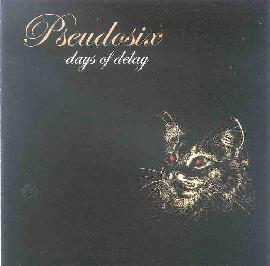 Pseudosix - "Days Of Delay"
PseudoSix are a young three piece band from Portland, Oregon. I had a hard time to come up with words to describe this CD, but here it goes: Sometimes boring, sometimes quite moving, but never exciting. A very mellow, personal mood ring group experience that comes across as sort of 21st century folk singers. The 13 tracks feature very personal lyrics that sometimes come across as brilliant and other times pretentious. I think your best bet is to check out the sound samples and give it a go. For more information you can visit the 54040' or Fight! web site at: http://www.fiftyfourfortyorfight.com. Contact via snail mail c/o 54040' or Fight! ; PO Box 1601; Acme, MI 49610-1601.